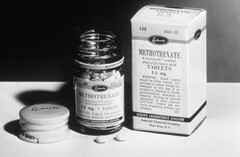 Bottle of methotrexate. It is used to treat some types of cancer, rheumatoid arthritis, and severe skin conditions, such as psoriasis. Methotrexate stops cells from making DNA and may kill cancer cells. It is a type of antimetabolite. Also called amethopterin, MTX, and Rheumatrex.